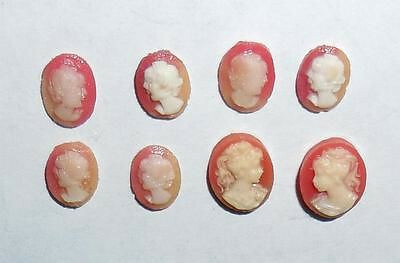 This is a group of 8 very small vintage highly detailed resin cameo ladies for earrings or jewelry making. They were originally used on small 1960s 14K gold earrings. Old store stock. There are 4 pair for a total of 8 individual cameos. They range from 5/16" tall North to South to 3/8" tall. All are excellent condition. 800 Silver Mediterranean Red Coral Hand Painted Portrait Pendant Pin Age: Late Victorian to Early Art Deco Metal: 800 Silver Hallmark: 800 Origin: Likely Italy Size: 1 3/4" tall North to South by 1 7/16" across East to West. Weight is 10.5 grams. Condition: Completely original estate jewelry, very minor age wear. Excellent, gently used condition. No dents, dings or tears. No repair. All filigree is still good. No damage to portrait or red coral stones. Beautiful estate find for your antique and vintage jewelry collection. 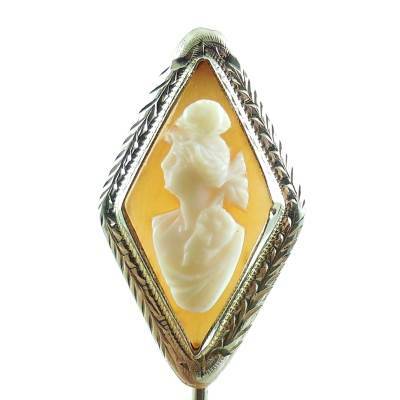 For sale is an antique 1920s Art Deco 14k white gold cameo stickpin. 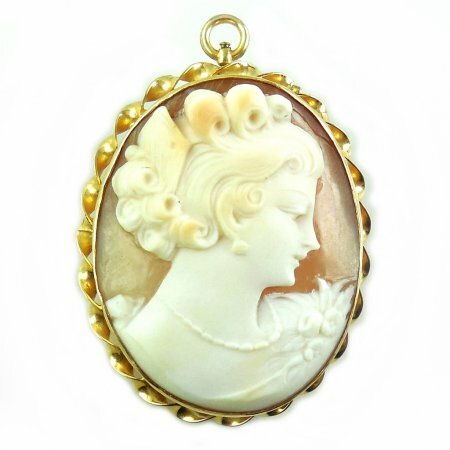 The cameo is completely carved by hand from a natural sea shell. Although the pin is very small, the detail work is very crisp and sharp. The diamond shape cameo measures 7/8 of an inch by 1/2 of an inch. The pin is a total of 2 & 3/4 inches long. There is no damage or repair to the cameo, and no visible damage or scratching to the shell. We have provided a photo of the back of the cameo against a light source so you can see there are no scratches or cracks in the cameo. 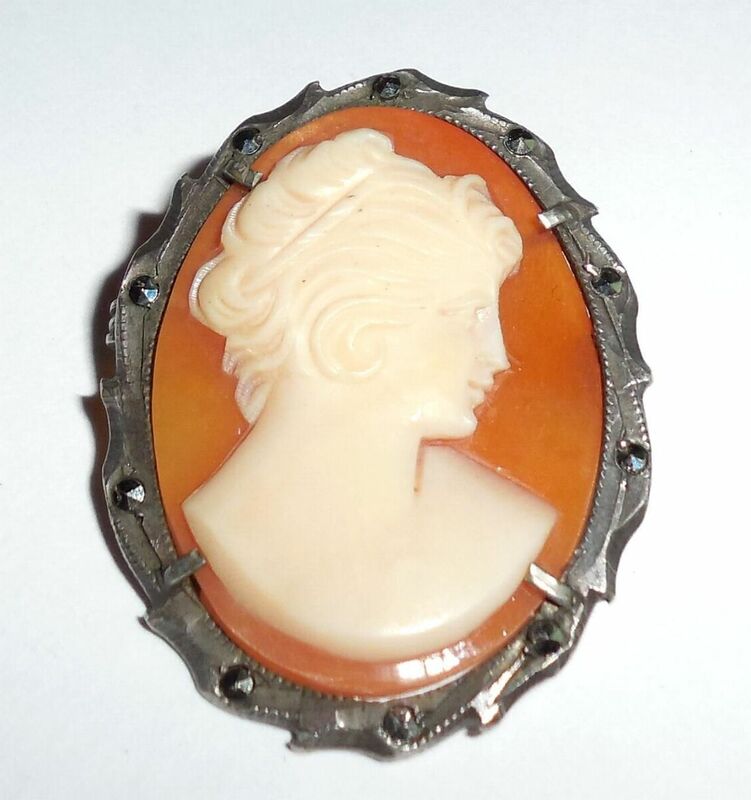 This is a wonderful antique 14K natural shell cameo pin for your collection. Also, if you are a jewelry designer/conversion artist you may wish to consider converting this into an antique ring. 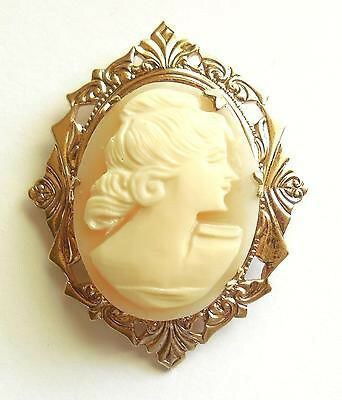 This is a gorgeous and very well made vintage antique Art Deco 1920s-30s 10K yellow gold natural carved shell cameo pendant pin. It is marked and Guaranteed to be solid 10K gold; NOT plated or filled. It has a very thick, solidly made and well crafted 10K gold fancy twist frame. It also has its original antique hinged swivel bale on the back. The cameo is beautifully carved with fine crisp details. She has a deep carved and noticeable intaglio eye with eyebrow, carved button earring and necklace, fancy flowers, very fancy hairdo, well chiseled chin and a well defined nose. Size is just over 1 1/2" tall with the small bale by 1 1/16" wide. Weight is 7.5 grams. Condition is extremely excellent. The back of the cameo has white residue from age and could use some cleaning. No cracks or chips to the cameo. No wear to the 10K gold - frame is still very, very thick. The locking mechanism is secure and works easily. The old hinged swivel bale is also fine. 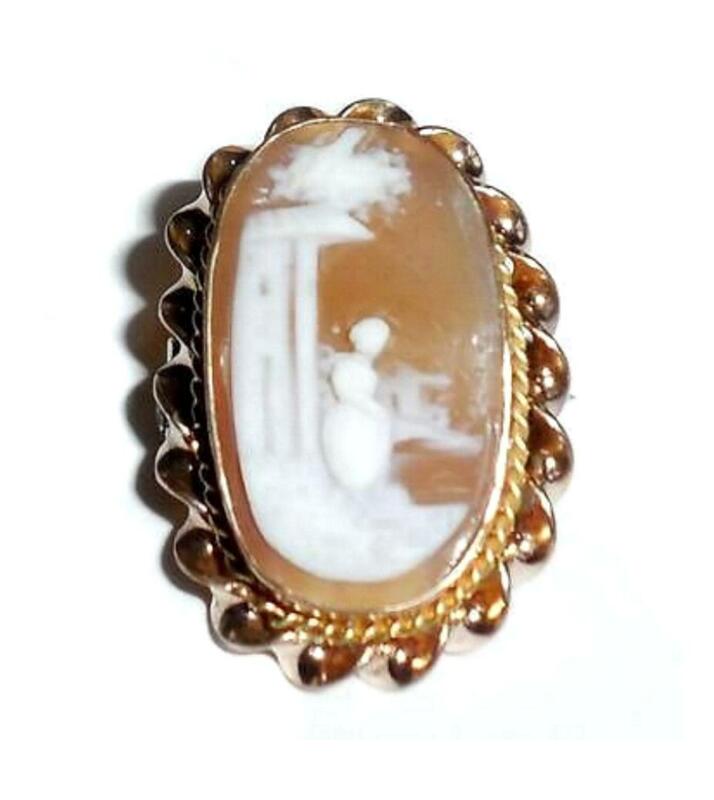 This is a lovely 1/4" deep pendant pin for your antique and vintage cameo collection with good weight in solid 10K gold. It is showy and very pretty! Antique Art Deco 14K White Gold carved shell signed cameo pendant or pin Very fancy 1920s filigree frame with hand applied rosette flowers. Marked and Guaranteed to be solid 14K gold. Excellent Condition. Hinged bail. Good locking clasp. The back has an etched artist signature. Weight is 5.4 grams. The cameo is a very light weight shell and weighs very little. Most of the weight is here is in the gold. She is beautifully carved with fine details: intaglio eye, carved flower, small upturned nose, deep carved hair, flower on dress and a small rounded up facing chin. Size is just about 1 1/2" tall North to South by 1 1/8" wide East to West. This is a gorgeous estate find for your antique and vintage fine jewelry collection. 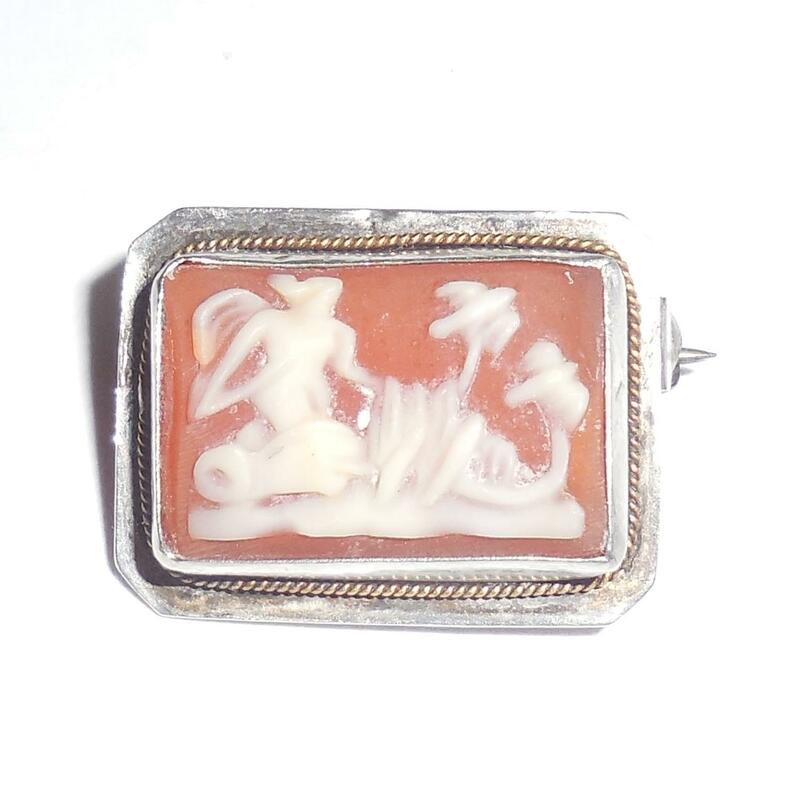 Antique late Edwardian to early Art Deco solid 14K white gold fancy carved shell cameo pendant pin with a hinged bale. Beautifully detailed carving with back swept hair with flowers, a deep intaglio carved eye, tiny straight dainty upturned nose and balanced chin and lips. She also has flowers draping down from her hair and additional carved flowers on her shoulder attached to her layered blouse. Fancy 14K white gold frame with small intricate filigree work and hand applied bird shaped white gold elements on each corner of the octagonal frame. Size is 1 3/4" tall including the small bale by 1 3/8" wide. Weight is 8.3 grams. Weight is the gold. The cameo is very, very light. EXCELLENT, ORIGINAL CONDITION. No cracks or wear to the cameo. The carving is still very crisp and detailed - not worn down. No damage or repair. 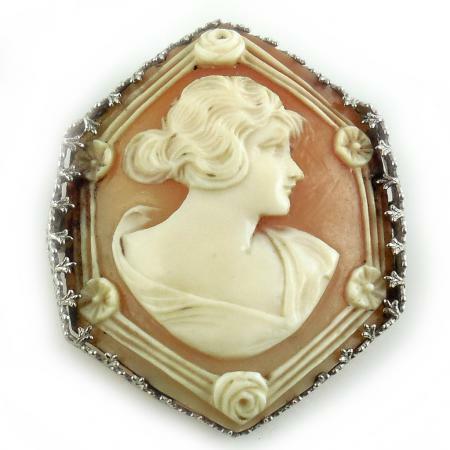 An absolutely gorgeous antique estate cameo for any discriminating collection. Wear as a pin or just add a chain for a stunning dangle necklace. For sale is an Edwardian to Early Art Deco hand carved cameo shell pin set in a 14k white gold frame. The frame features fancy fleur de lis prongs, filigree open work on the sides and an engraved twist design on the gold edges. The frame is marked 14k. Cameo has a beautifully carved border, rosettes, pansies, strong facial features and hair. Weight is 7.1 grams. Size is 1 3/4" tall North to South by 1 5/16" wide East to West. The condition is excellent with no cracks, chips, flakes, dents or damage. It has one thin scratch line on the back but it is not visible on the front. The natural shell has a deep curve which causes the cameo to sit higher in the setting on the top and bottom than on the sides. This is characteristic of the piece of shell that was used. This is an exquisite and rare cameo for your collection. Antique Edwardian Sterling Silver Gold Chariot Cameo Lingerie Pin S This is a very detailed antique late Victorian to early Edwardian carved shell cameo and sterling silver lingerie pin with a twisted gold wrap. It has been jeweler tested and is Guaranteed to be solid sterling silver and genuine antique. The gold wrap is either low grade European gold or gold filled. This pin may have had a antique locking clasp upgrade in the 1930s. You can see the tiny hand applied old rivets in the back that are holding the clasp to the back of the pin which likely had an early c clasp without a lock. It is all hand made, hand carved and hand cut with the gold wrap being separately hand applied, all indicative of its 1890s to 1920 age. Excellent overall condition. A little minor edge wear on the back. No cracks or chips or flakes or breaks. No damage or repair. Unusual and highly detailed with desert motif of palm trees, cacti and a Greek god controlling a chariot. This is a lovely antique lingerie pin for your antique jewelry or antique clothing accessories collection. This kind of detail is very Hard to find in this small size, 11/16" by 1/2". Nice estate find. Would also look beautiful on an antique French doll. Antique late Victorian to early Art Deco 10K yellow gold natural carved shell cameo pendant with its original round hinged antique bale for a necklace. This is an early one that is very intricately and beautifully carved and has pearls applied to the handmade 10K gold frame. It is marked 10K on the bale and is thoroughly jeweler tested and guaranteed to be solid 10K yellow gold. It is from an estate and all parts are original. It has a very, very tiny 1/4mm cut on the the sides of one pearl that is not eye obvious. Must look for it with a loupe. Probably from the removal of a pin rod many years ago. Other than this it is excellent. The lady portrait is exquisitely carved with fine crisp details and good, strong depth. Amid her hair is an unusual carved cap. Size is just about 1 1/2" tall north to south with the bale by 7/8" wide across. Weight is 4.8 grams. 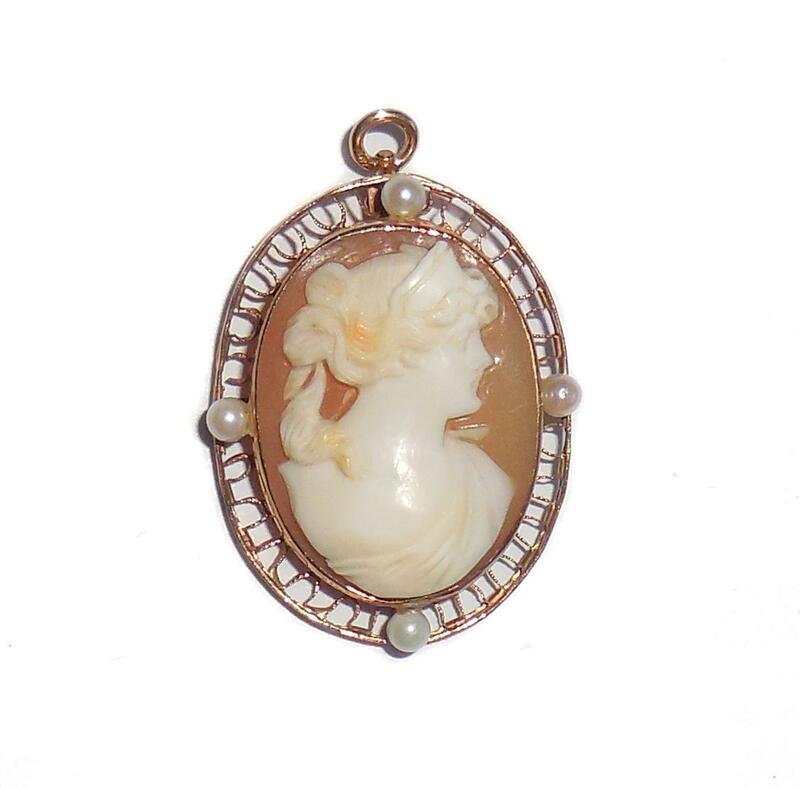 This is a gorgeous antique Victorian gold cameo pendant for your collection. 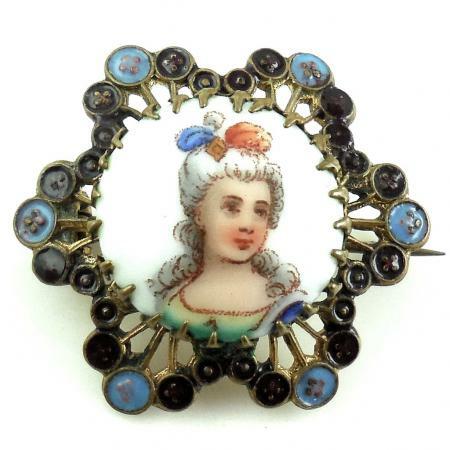 Early Gold Filled or Brass......This is a GORGEOUS small antique Early Victorian mid 1800s HAND PAINTED portrait on porcelain pin with a 24 prong hand set mounting and her original antique enameled setting. It has 2 old rectangular punch marks/hallmarks on the back. Early and very well made by hand. The metal is very thick, solid, and strong – can't bend it. It has quite a bit of aged patina which has not been cleaned. The original Victorian C-Clasp is still intact. Pin rod is very long indicative of its early Victorian making and has a thick wrapped t-bar. Size is just over 1″ across. There is one small gold solder drip on the back from the original making. No damage or repair. Condition is excellent. No dents or dings. All of the fancy open work is fine; no breaks. Completely original. Good, strong enameling. No touch ups. No alteration of any kind. Not polished out. The painted portrait is also fine; no cracks or chips to the porcelain. She is beautifully hand painted with fine intricate details to her facial features, hair and clothing. Very, very pretty. 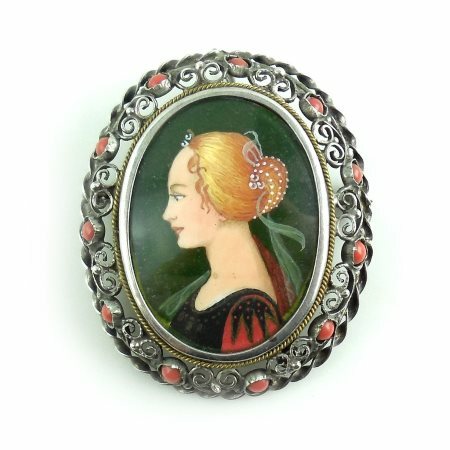 Hard to find this quality painting in such a small size, this is a lovely Victorian portrait miniature pin in unusually fine, original condition for your antique jewelry collection. Beautiful 1920s to 1930s early Art Deco 14K Yellow Gold carved shell cameo pendant or pin with its original hinged bale in excellent condition. It has intricate, highly detailed carving with fancy hair with multiple drippy floral hairpieces, intaglio eyes, small straight nose and small full pursed lips. Weight is 7.4 grams. Size is 1 3/8" by 1 1/8". 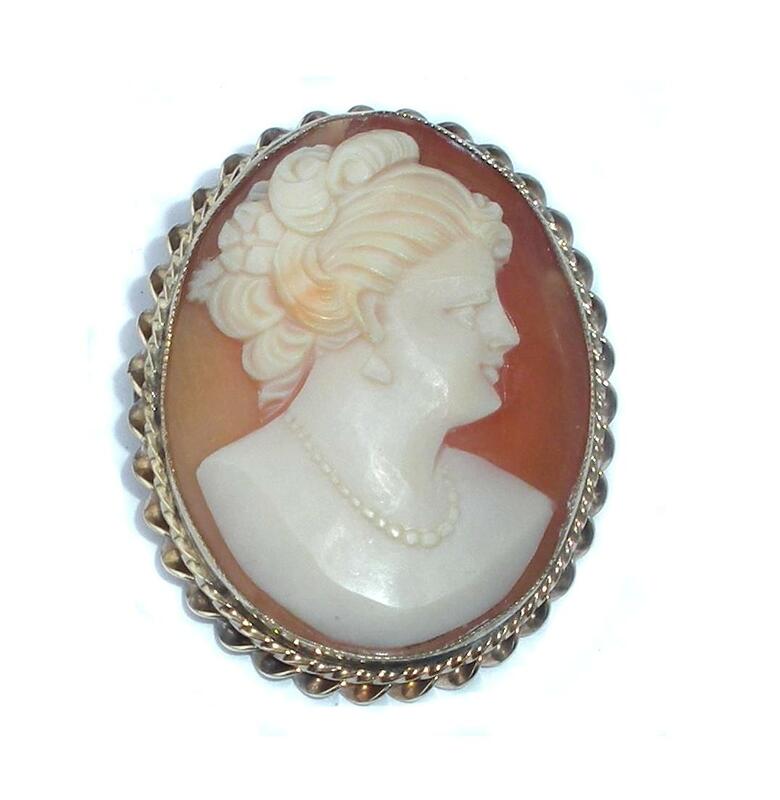 A lovely original antique estate cameo for your collection. 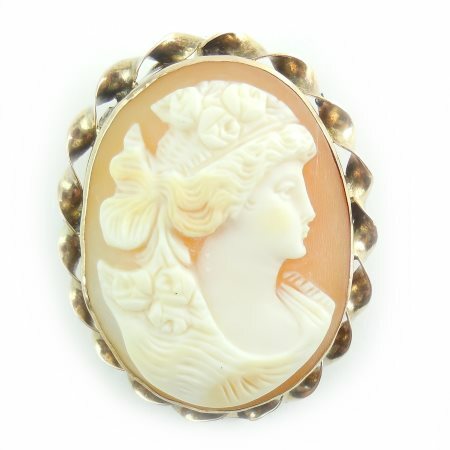 This is an Art Deco 1/20th 12K gold filled carved shell cameo pendant and pin with its original, early hinged bail. Marked 1/20th 12K GF Amco. There is NO wear to the gold filled. Carving is deep and elaborate. Size is 1 3/8" from top to bottom by 1 1/8" wide across. Weight is 6.7 grams. It also has a good secure locking mechanism and a strong hidden bale. Just add any chain for a lovely Art Deco necklace that looks and wears like real gold. Or use as a pin on your neck collar or lapel. Art Deco 12k Gold Filled Carved Shell Cameo Screw Earrings Lovely 1930s estate jewelry find. The cameos are all natural shell, carved and bezel set. The screw back findings are marked 1/20 12K Gold Filled. They are also strong, secure, well made and work easily. Size of each cameo is 17mm or 3/4" from top to bottom. Condition is original and excellent having only minor age wear on the backs. 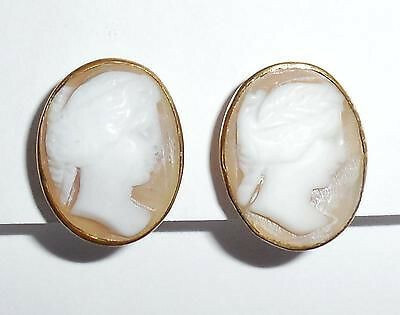 This is a lovely pair of earrings for your antique cameo jewelry collection. 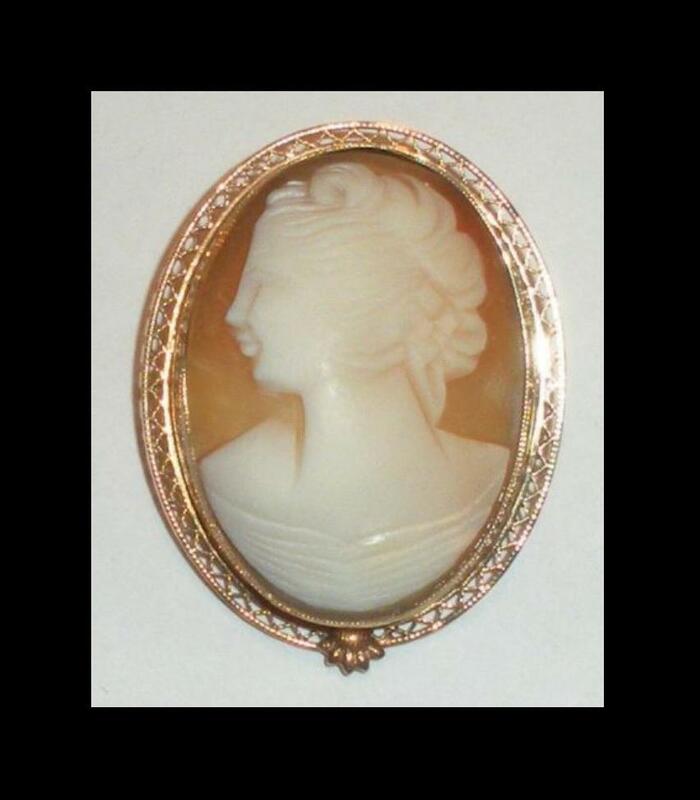 From an estate, this cameo has an acid etched signature that is seen with a loupe but can not be captured in the photo. It is all original, excellent condition. No damage or repair. No crack or chips or flakes. All gold filled intact and looks beautiful. Vintage late Art Deco gold filled fancy filigree natural carved shell cameo pin or pendant for a necklace. Marked 1/20th 12K GF. Size is 1 7/16" tall by 1 1/8" wide across. Cameo is 30mm by 22mm. All deeply hand carved and hand made. Beautifully detailed with fancy carved hairdo, long showy intaglio eye with carved brow, a small upturned nose, carved necklace and blouse. 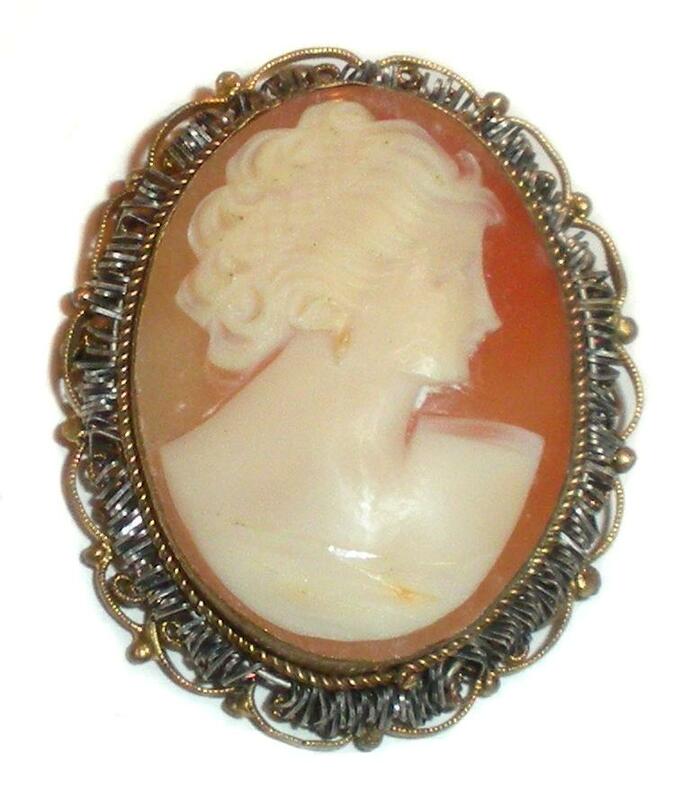 A lovely old estate find from many, many years ago for your antique jewelry or cameo collection. This is a lovely antique 1930s Art Deco right facing carved shell cameo estate pendant pin in fancy gold filigree and silver. The filigree is likely European 800 or another grade of silver with a 1930s vermeilled gold wash. Condition is excellent. She has beautiful, deep carved workmanship with fancy hair, upturned nose, open intaglio eye and full up slanted mouth. No damage. Size is 1 1/2" tall by 1 1/4" wide across. A lovely old estate addition from many, many years ago with beautiful workmanship for your cameo collection. 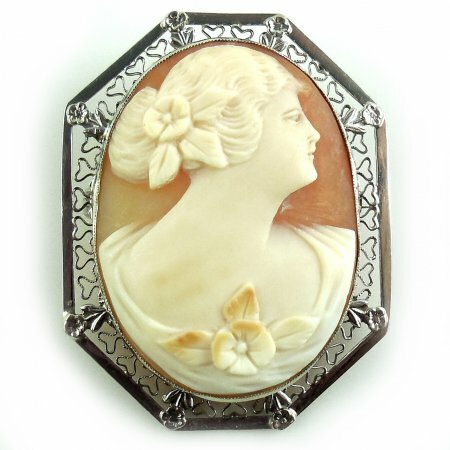 This is a lovely Art Deco hand carved natural shell cameo pendant or pin in solid 800 Fine Italian silver with marcasites. Marked 800. Tested and Guaranteed to be solid 800 silver.....Not plated. Size is 1 7/16" North to South including the bale by 7/8" wide across East to West. She is beautifully made and deeply carved with fine details. The frame has all of its original faceted marcasites and very, very tiny cut work on the edge of the bezel. No tears or dents or deep scratches. No cracks or chips. Excellent Condition and directly from an estate so it has not been polished out. Still nice and crisp with fine detail. 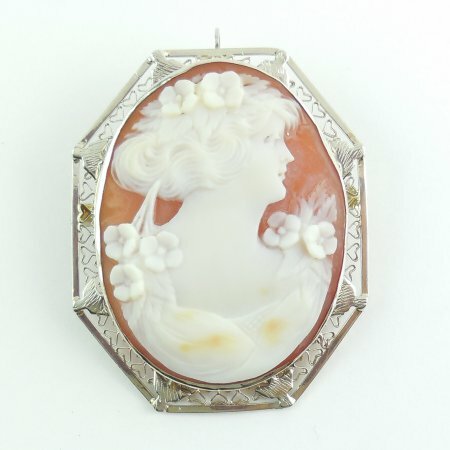 This is a beautiful Art Deco statement cameo for your collection to use as a pin or necklace pendant.